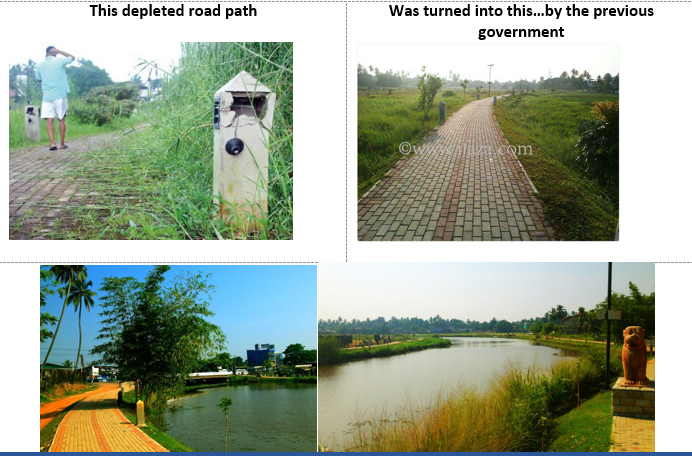 LankaWeb – Who gave orders to destroy the Wattala-Kalu Ela Jogging Track in Gampaha District? Who gave orders to destroy the Wattala-Kalu Ela Jogging Track in Gampaha District? 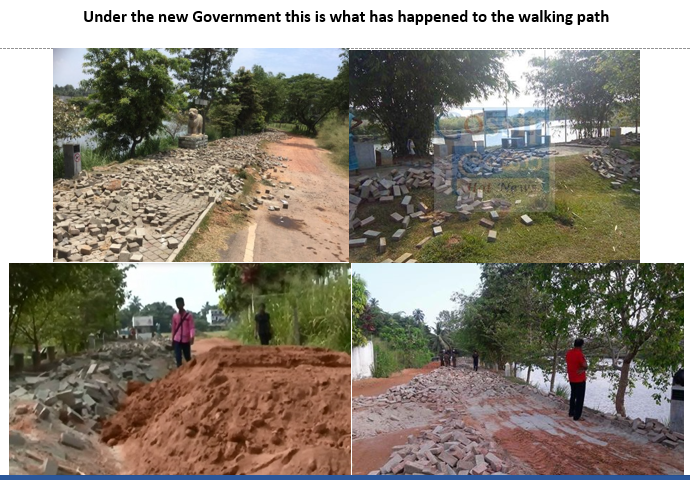 A few days ago the Wattala Jogging Track was destroyed by orders of the Yahapalana Government. This track was created at an expense of 6.5million of taxpayer’s money by the previous government. Whatever differences political parties and politicians have with each other the comforts made available to the people using tax payers money and loans for which interest will again be paid by the tax payers cannot be destroyed because of vengeance, jealousy or due to corrupt deals. The yahapalana government has some explaining to do to the people of Wattala and to the general public. After destroying the track and as a result of public outrage the yahapalana government is now saying they are going to rebuild it. Who is going to be paying for this double wastage? People have become too busy, too stressed out and becoming too fat. So when the decision to create walkaways was initially introduced like all new ventures it was looked down upon. But soon people began to start using these pathways to exercise and found it not only relaxing but the physical exercise was improving their health. Urban and sub-urban Sri Lankans with poor diets, bad eating habits and work stress and personal problems were becoming sick. Jogging became an outlet to release extra pounds and relax. It appears that this is another act of revenge against the Rajapakshe regime. Like destruction or obstruction of the Mattala airport, Hambantota port, the Port city project, Avante garde the Lotus tower project etc which were done to fool the people in to believing that all the projects by Rajapakshe were no good. Now John Ameratunge says they will spend another Rs. 80 million and build it back. What is the matter with Yahapalanaya? You do not need to destroy projects that have already been done. Just do something new and useful for the people. Now 14 months have gone only in chasing behind Rajapakshes and trying to pin blame on the whole family. Nothing else has been done by this set of jokers. My3 goes round giving grandiose speeches. Ranil does the same. The two people cannot agree on anything. So how can the country move forward. CBK is on the side spouting her hatred and venom at Rajapakshes and telling lies at every turn. This Govt is like the keystone cops. Nobody seems to be able to agree on anything. THERE IS NO END TO **RAJAPAKSE** BASHING. SENEVIRATNE DID THIS AS AN ACT OF REVENGE, BECAUSE IT WAS DURING RAJAPAKSES TIME THIS WAS BUILT FOR THE PEOPLE. SO HE DECIDES TO BREAK IT DOWN. HE MUST NOW BE WANTING TO SPEND HIS PERSONAL FINANCES TO RE-BUILD I BELIEVE. THESE ARE SICK PEOPLE OF THE SIRAA PALANAYA GOVERNMENT. IT IS ONE AND A HALF YEARS NOW, AND WHENEVER A STINKING SIRAA PALANAYA GOVERNMENT POLITICIAN COMES ON TV, THEY WILL NOT HESITATE TO MENTION RAJAPAKSES NAME IN A DEROGATORY MANNEER. THIS INCLUDES THE PRIME MINISTER. THESE IMBECILES THINK THAT THEY ARE MAKING THE PEOPLE SICK OF THE RAJAPAKSES, BUT IN THEIR SICK MINDS,THEY DO NOT REALIZE THAT THEY ARE KEEPING THE FLAME OF RAJAPAKSES ETERNALLY BURNING. PEOPLE WILL NEVER GET A CHANCE TO FORGET THE RAJAPAKSES FOR EVER. EVERYTIME THESE MEDICANTS BASH RAJAPAKSES, THE PEOPLE BEGIN TO LOVE HIM MORE. COME ELECTIONS, THE RAJAPAKSES WILL BE IN THE FOREFRONT. PERIOD. I think after John Ameratunge rebuilds the walk way he will remove the foundation stone with Mahinda’s name on it and put a stone with his name on it. This is what it is all about. These people are sick in their minds. High time he resigned his position over this issue. SORRY, SORRY, IT WAS JOHN AMERATUNGA WHO GOT IT BROKEN DOWN. I GOT IT CONFUSED TO JOHN SENEVIRATNE. APOLOGIES. THIS SHOWS HOW THESE PARLIAMENTARY IDIOTS CAN USE THEIR ARROGANCE AND **AUTHORITY** FOR WHICH THEY DO NOT HAVE A MANDATE, USE IT AT WILL, JUST AT THE DROP OF A HAT. THESE (S.F.) UCKERS SHOULD BE BUNDLED AND THROW DOWN A CLIFF TO REACH THEIR WORTHY DESTINATION. WRONG DECISION TAKING IS NOW A PART OF PARLIAMENTARY PROCEDURE. PLEASE TELL ME JUST ONE THING THAT THISF SUCKER HAS DONE FOR THE BENEFIT OF THE PEOPLE AND THE COUNTRY ?? NOTHING. HE IS PLAYING ABOUT WITH POOR PEOPLES MONEY. HE HAS TO BE PUNISHED. TAKE AWAY HIS BLOATED AUTHORITY AND HE SHOULD DEFLATE. Where is that JOKER-WAIRASENA-UNGREATFUL TRAITOR WHO ALWAYS COMES ON TV AND SPEAKS LIKE A SAINT AS IF THIS IDIOT HAS COME FROM HEAVEN WHERE AS HE HAS COME DIRECTLY FROM “HELL”!!! MR-WAIRASENA & COMMODE FACED CBK AND THE COHORTS CANNOT GULP THE WONDERFUL PROJECTS CARRIED OUT BY THE RAJAPAKSAS.WITH THAT VENGEANS IN MIND THEY RUN MAD AND DO ALL FOOLISH THINGS. THIS JOGGING PATH WAS USED VERY HAPPILY BY THE RESIDENTS AROUND WHO ARE NOT BILLIONERS LIKE JOHN,RAVI AND THE HORA GANG.THESE IDIOTS CANNOT THINK OF ANY GOOD PROJECT TO BENEFIT THE ORDINARY MASSES,INSTED OVER THE PAST ONE AND A HALF YEARS THEY WERE HARASSING THE RAJAPAKSES,FAMILY MEMBERS,GREAT ARMY,NAVY & AIRFORCE PERSONNAL. HEY BANDIT WAIRASENA THE FORMER GRAMASEVAKA,OPEN YOUR BLIND EYES AND STOP THIS FOOLISH,REVENGEFUL ACTS!!!!!! they don’t give a damn! still can’t see these murderous (Buddhists only) gang’s activities! I don’t say this is Rajapakse bashing. John Ameratunga and his henchmen did this on an underhand deal to make money. As usual they consider themselves above the law and above the vast majority who voted for them. They serve only the users (just like them) who brought them to power to make money. This time the ordinary citizen won. When the news got flashed all over the internet and the media, John had to give in. He could not bulldoze his way. I saw Harin Fernando too saying that the Walk Way built by Gota’s ministry was not an approved construction. People are sick and tired of this government. Sirisena and Ranil behave as if they live in another planet. I like the people also to keep a track on whose money is going to the re-construction. John cannot use government money for this. Also, the walkway must meet all the previous high standards of the Rajapakse regime. Mahinda Rajapaksha wasn’t perfect but he was moving Sri Lanka in the right direction, trying to recover from 26 years of instability. I was in Sri Lanka on January 15th 2015 I thought Mahinda Rajapaksha retaining his premiership would be a formality and I can tell you I was honestly shocked the morning after when I heard he lost the election. I am no fan of any politician but for Sri Lanka Mahinda Rajapaksha was as good as it gets. Six years in, Mahinda Rajapaksha’s Sri Lanka was starting to look in an increasingly unstable world a top place to go and live in and visit. Certainly another five or six years more of Mahinda Rajapaksha and I would say honestly Sri Lanka would have become one of the most desirable places to go and live in in the world. Especially when much of the rest of the world especially west was going to pot. He was beautifying and developing Sri lanka at a rapid rate. Every time I visited Sri Lanka during his tenure I could see Sri Lanka’s improvement. A few more years of him and Sri Lanka would have been a brilliant place to live in a deteriorating world. Sadly that all changed on Jan 2015. Sri Lanka’s progress halted and some cases gone backwards. Sri Lanka deserves better we who visit and want to live there again deserve better. Its not too late to put the ship back on track. Hopefully Mahinda Rajapaksha stays healthy he and much his team can return back to leadership. As more and more people in Sri Lanka realize what a terrible mistake they made for not giving him a landslide majority victory on Jan 2015. I for one have my fingers crossed that he will be voted back in the not too distant future. Return Sri Lanka to the positive place it was when he was leader. This entry was posted on Tuesday, March 29th, 2016. You can follow any responses to this entry through the RSS 2.0 feed. You can skip to the end and leave a response.